The Feed My Starving Children Committee is currently looking for input on the 2018 event. Volunteers filled the Haddonfield Middle School Gym for the 2017 Feed My Starving Children packing event. The Mobile Food Packing event for “It Takes a Village — Feed My Starving Children 2018” is set for April 20, 21 and 22, but the planning has already begun. The Feed My Starving Children Committee is looking for input on the event and will hold their next planning meeting on Sunday, Sept. 10 at 7 p.m. at First Presbyterian Church in Haddonfield. Next year’s packing will take place at the Cherry Hill Armory rather than at the Haddonfield Middle School. The committee is encouraging people to mark their calendars now so they have plenty of time to sign up in the spring. Feed My Starving Children is a faith-based organization dedicated to providing food for children and others world-wide who are at risk due to devastating hunger. 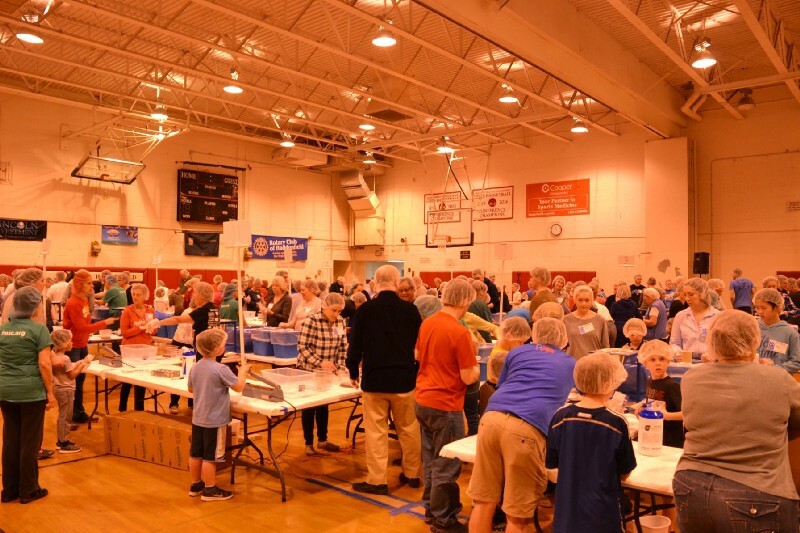 The Haddonfield Council of Churches has sponsored this food packing event for the past five years, and last year, more than 300,000 meals were packed in one weekend by 1,600 volunteers of all ages and abilities. The FMSC Committee is always welcoming to anyone who would like to become more involved. Meetings are held approximately once a month and the current meeting place is at the First Presbyterian Church in Haddonfield. The time commitment can be flexible. The committee is seeking community input and suggestions on how to make the event bigger and better. The next meeting is on September 10th at 7 p.m. For more information, contact Gerry Rice, gerviola@mac.com or ittakesavillage-fmsc.com.